I recently received the Whirl™ Laser Mouse w/ Anti-Gravity Comfort Pivot to review first hand. I will say I was a little intimidated when I took it out of the box and saw how big it was. I am used to a smaller sized mouse that I use with my laptop. However, I was determined to go into the review with an open mind. I did like how the USB plug that came stored on the underside of the mouse was very small so it didn't stick out very far when plugged into my laptop. All I had to do was plug it into a USB slot and it was ready to go. A few hours into the testing I was not real thrilled with the mouse, it was very uncomfortable on my wrist. I have small hands and I had to keep my arm raised to be able to use it right. BUT after I positioned a wrist wrest under my hand I had a lot better luck with it. That helped line my hand up with the height of the mouse and felt a lot more comfortable. The pivoting of the mouse took some getting used to also, it was weird having the mouse moving all over as I slid it around on the mouse pad. Once again, once I used it for awhile I got more comfortable with moving it around. I went to use another computer in our house and it felt odd having a mouse that didn't pivot. You really can tell the difference in how your wrist feels after using the pivoting mouse, it doesn't feel all stiff afterward. I found on the Smartfish website that they offer a mini version of this mouse so I might just have to invest in that version to see how it feels. I really think I'd prefer a smaller version, but that's just what I am used to, I've always used a mini mouse with my laptop. For Desktop use, it’s time to get rid of that old-fashioned “laser mouse” and upgrade to the comfort of the Whirl™ Desktop Mouse with ErgoMotion™ -- the world’s first truly ergonomic desktop mouse. 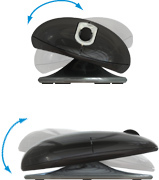 No other desktop mouse provides the fluid, air-like comfort of the patented ErgoMotion™ pivot system. The Smartfish ErgoMotion Mouse is a symmetrical design created for both left and right-handed users alike, making the ErgoMotion™ Mouse the most comfortable device for everyone. ErgoMotion is a revolutionary technology that applies motion to experiences, a solution that actually reduces the risks of Repetitive Stress Injury (RSI). The ErgoMotion Laser Mouse challenges other “fixed position” mice by utilizing a patented pivot base that adapts to your natural hand and wrist movements. The mouse conforms to your unique positions, alleviating discomfort and encouraging productivity while you work. ErgoMotion is a breakthrough technology that has been designed in collaboration with the Hospital for Special Surgery (HSS) in New York — the #1 rated Orthopedics Hospital. Buy it: You can buy the ErgoMotion Whirl Mouse on their website. Giveaway CLOSED - Congratulations to the winner (PaulineMilner) you have been notified via email and have 48 hours to reply or a new winner will be chosen. Win it: One lucky reader will win a Whirl™ Laser Mouse w/ Anti-Gravity Comfort Pivot ($50 value). This giveaway will end Feb 11th at 10 PM EST. The winner will have 48 hours to respond to my email. If no response, a new winner will be chosen. Open to residents of the US/Canada. *Tell me why you'd like to win the ErgoMotion Mouse, and who you'd want it for. • Tweet this giveaway (may be done once per day - please leave a comment below with your tweet status) "RT #win an ErgoMotion Mouse HERE: http://t.co/Lc931M5 (Ends 2-11) #Giveaways"